Many instructors view blended courses as the “best of both worlds,” as they can leverage the most effective approaches available in the online and face-to-face formats, and students appreciate the flexibility that blended courses afford them. Moreover, a 2010 Department of Education meta-analysis suggests that students may even learn better in blended courses than in traditional, face-to-face courses. UWM’s Center for Excellence in Teaching and Learning provides support for blended courses in the form of the Online and Blended Teaching Program, a variety of online resources, and individual consultations with instructors. Over 100 blended courses are offered each semester, and are often attractive to students who may need to supplement their online enrollment with some classes not available fully online (e.g. in order to satisfy General Education or other degree requirements). The Schedule of Classes features a separate schedule for blended classes. 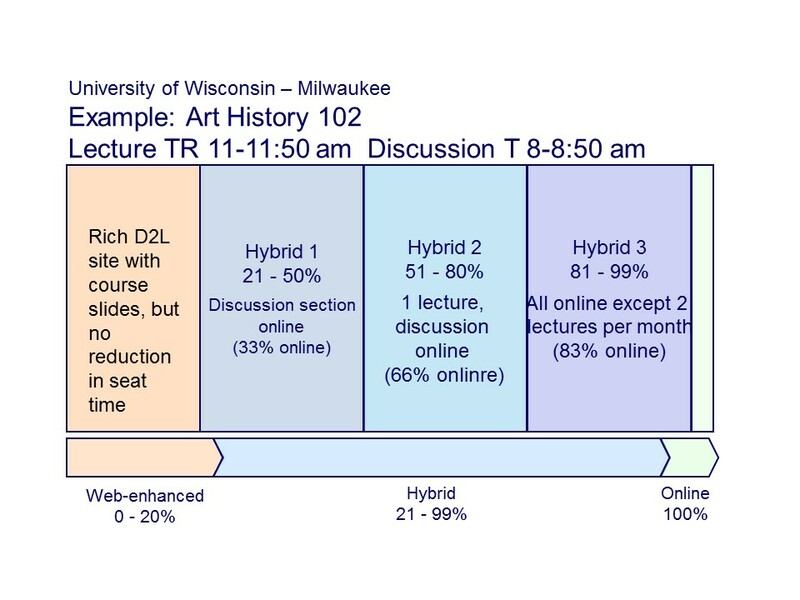 Each hybrid designation (H1, H2, H3) has a field in the PAWS scheduling interface. Department personnel who enter each term’s scheduling information should correctly designate the type of blended class. For more detailed information on scheduling and coding hybrid courses, contact the Registrar’s Office.